GBC Talks: "Religious Liberty in the 21st Century"
To what extent does religious liberty conflict with federal and state laws on a range of issues, or even personal choices? How should such conflicts be resolved, while protecting the Constitution's rights to religious liberty? This GBC Talks discussed the issues behind some of recent controversies and court cases around religious liberty. Recorded Wednesday, 21 February 2018, at Great Basin College. Copyright © 2018, Great Basin College. All rights reserved. 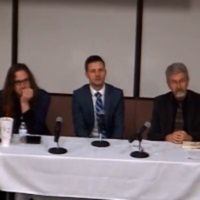 Virtual Humanities Center at Great Basin College, “GBC Talks: "Religious Liberty in the 21st Century",” Digital Humanities of the Great Basin at Great Basin College, accessed April 25, 2019, https://humanities.gbcnv.edu/omeka/items/show/420.